After I made today's gif, I promptly had a dream that I had a very sweet kitten who could talk to me. It was one of the best dreams I've had in a long time. I believe this is the type of visions one has on a spinster vision quest. The thing is, I didn't even have to go into the woods and fast to see it. I just ate dinner and took a shower. I was sad, though, to wake up and realize that I did not, in fact, have a magical talking kitten. Today is Friday, and the kitten is expressing how all of us feel about this day of the week. Last week I made a word search. 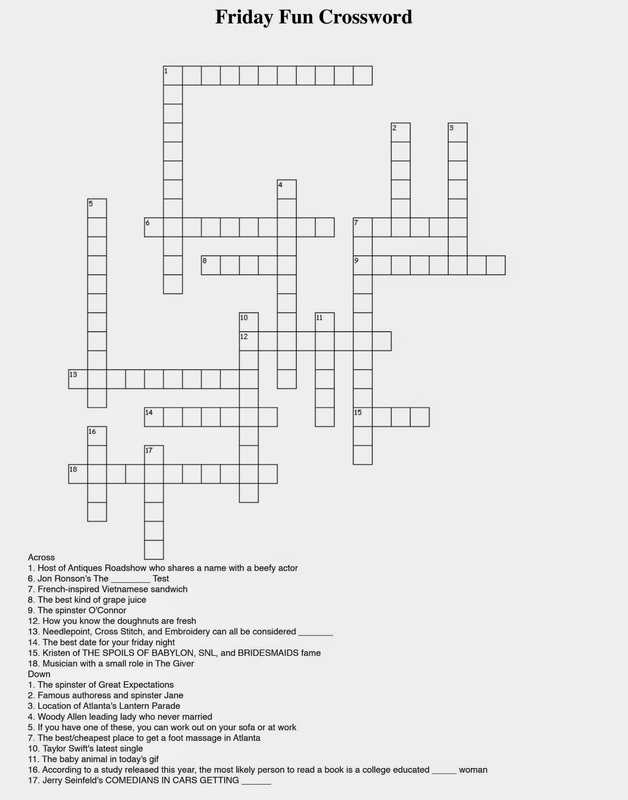 Today I thought I'd up my game a little and make a spinsterly crossword. The clues are a mixture of history, current events, and information from previous posts on The Spinsterhood Diaries. Good luck! Click below and print yours out! New in The Zazzle Spinster Store: Prints!